LINCOLN– Neb. – The Kansas City T-Bones found a way to pull out a 2-1 win against the Lincoln Saltdogs in Lincoln on Tuesday night at Haymarket Park despite not scoring an earned run in the win. Kansas City took advantage of two catastrophic errors in the second and seventh innings to seal the series-clinching win. In the top of the second, the T-Bones jumped out to an early 1-0 lead, thanks to a key error by Lincoln. With two outs, Keith Curcio races to second on a double to put the T-Bones in scoring position. 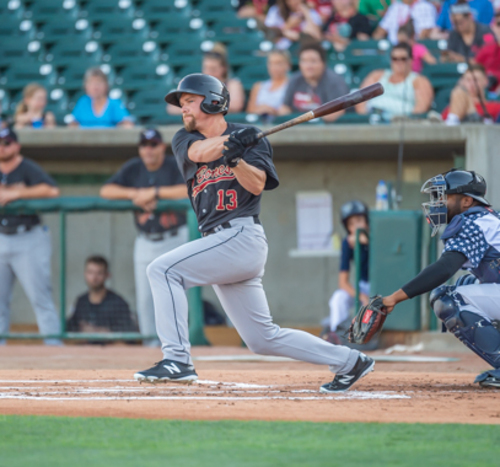 At the next at bat, Dexter Kjerstad reached first on a throwing error by the third basemen Christian Ibarra, allowing Curcio to score an unearned run from second base. Another heartbreaking error by Lincoln gave Kansas City the go-ahead run in the top of the seventh. With two outs and Adrian Nieto on third base, Mason Davis hit a pop fly to shallow right field that looked like it would end the inning, but Angel Reyes dropped the bal to allow Nieto to race home to score and Davis to stride into second for a 2-1 T-Bones lead. The T-Bones bullpen had to work out of two tough spots in the late innings to help secure the 32nd win of the season. Marcus Crescentini worked out of a jam in the eighth after the first two batters reached base, keeping the game at 2-1. Joe Filomeno worked the ninth but would face the winning run at the plate. After retiring the first batter with ease, the lefty walked the next batter then got the second out of the inning. Cesar Valera hit a fly ball to the warning track for the third out to notch the save. Tommy Collier (6-1) pitched a brilliant game in Lincoln, tossing seven innings and allowing six hits and one earned run. Collier now leads the team with six wins, posting a 4.41 ERA. Joe Filomeno (1) picks up his first save on the season, pitching a scoreless ninth inning for Kansas City. The T-Bones are back in the winning circle, and have gained a game on the first place Sioux City Explorers who lost Tuesday night. Kansas City is now 32-17 and find themselves 4.5 games back on the South Division lead. The Saltdogs lose their second straight game falling to 27-22 and are now 10 games back in the South Division race. The T-Bones and Saltdogs continue their three-game series Wednesday, July 10th at 6:45 P.M in Lincoln. Kansas City looks to extend their winning streak Wednesday in Lincoln against the Saltdogs, going for their second sweep of Lincoln on the season. Catch all the action with the voice of the T-Bones, Dan Vaughan, on the T-Bones Broadcast Network. Season, group, mini-plans and nightly party suites are on sale now and can be purchased by visiting the Box Office at T-Bones Stadium. Call the Box Office at 913-328-5618 or purchase and print at www.tbonesbaseball.com. Box office hours are 10:00 am to 4:00 pm Monday – Friday and 10:00 am to 2:00 pm Saturday. For additional information or interview requests, members of the media may contact the T-Bones Media Relations Department at (817) 739-3693. Stay tuned to www.tbonesbaseball.com. and the T-Bones Facebook and Twitter pages for updates throughout the season.